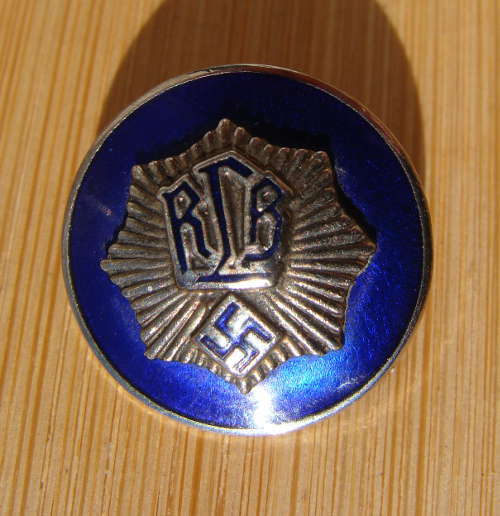 NSDAP Party Member's Badge - maker marked "RZM M1/148" for Heinrich Ulbrichts of Vienna an early example - 23mm dia. 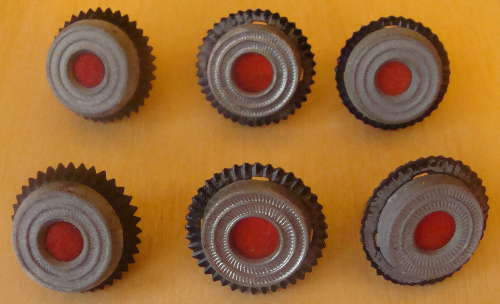 - material: bronze with pebbled translucent red enamel. 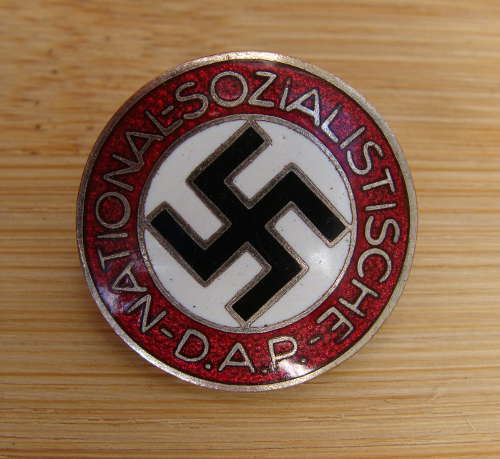 An rare original badge in excellent undamaged condition. 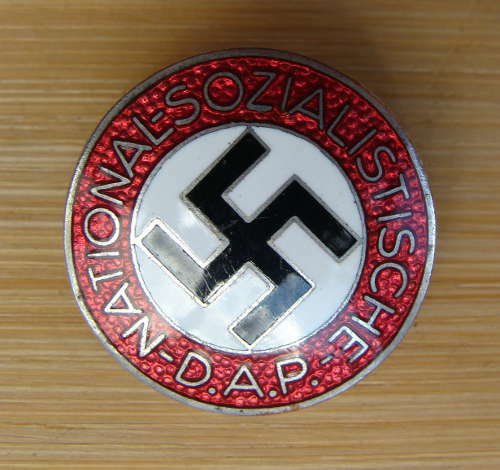 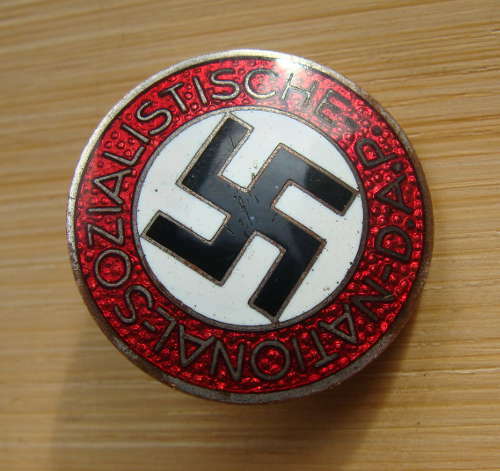 NSDAP Party Member's Badge - maker marked "RZM M1/8" for Ferdinand Wagner of Pforzheim - pebbled translucent red enamel - Pin fastening - material: enamelled white metal alloy - 23mm dia. 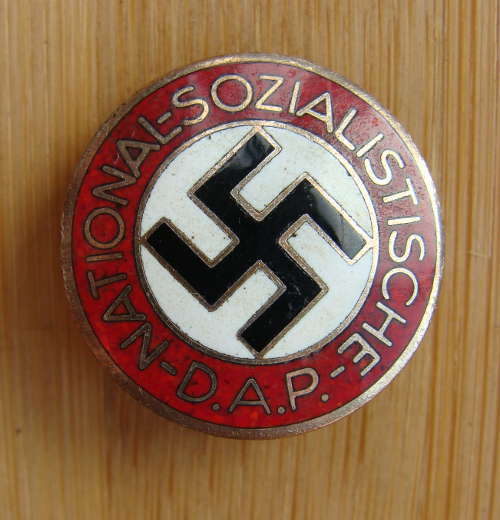 An original badge in excellent undamaged condition. 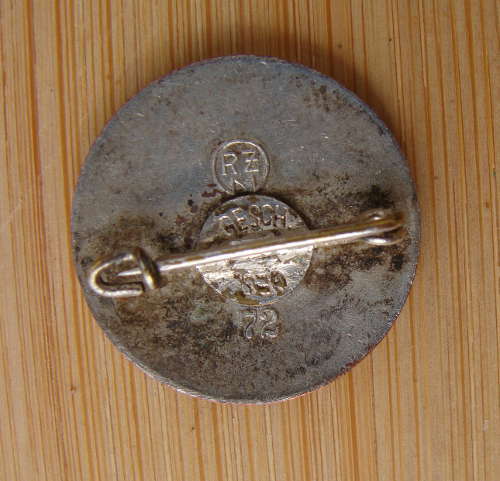 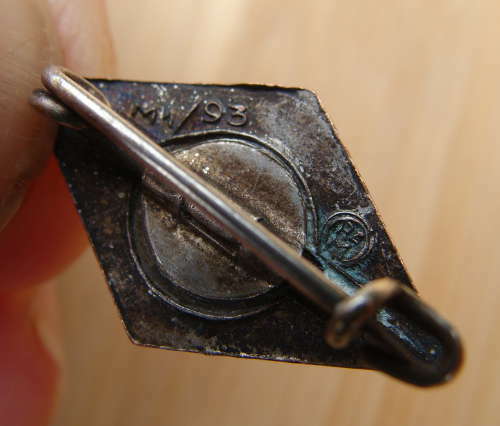 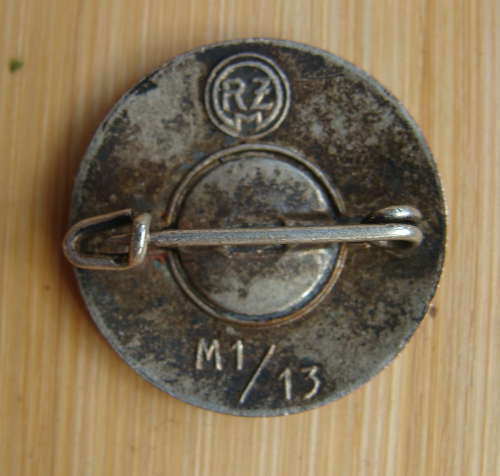 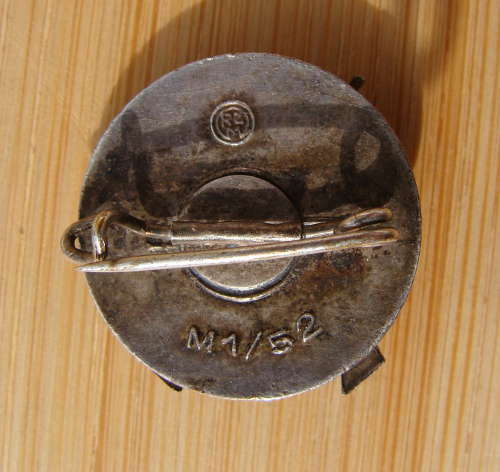 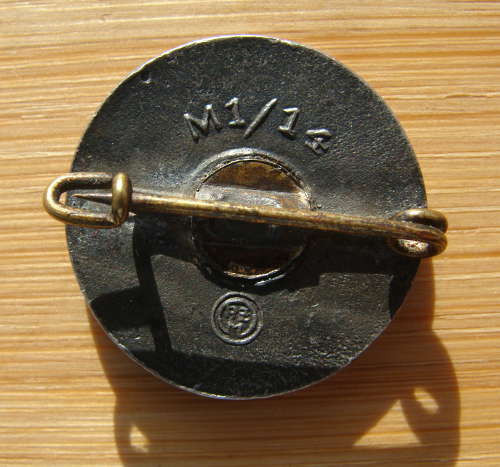 NSDAP Party Member's Badge - maker marked "RZM M1/6" for Karl Hensler of Pforzheim - 23mm dia. 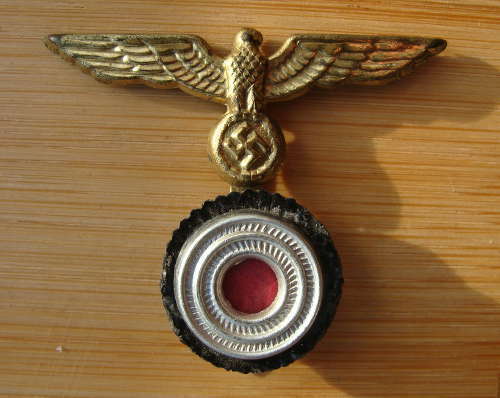 - material: plated bronze with pebbled translucent red enamel. 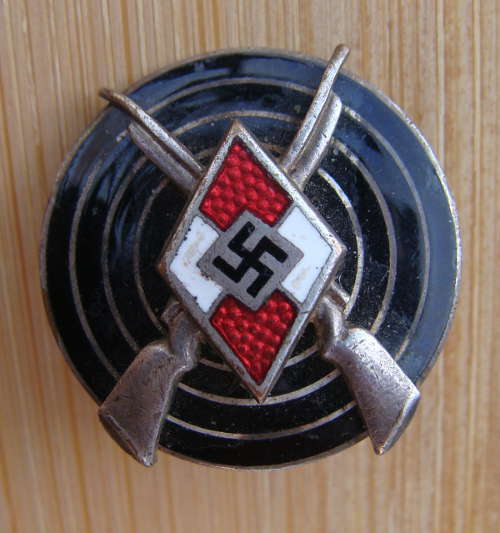 NSDAP Party Member's Badge - maker marked "RZM 72" for Fritz Zimmermann of Stuttgart - 23mm dia. 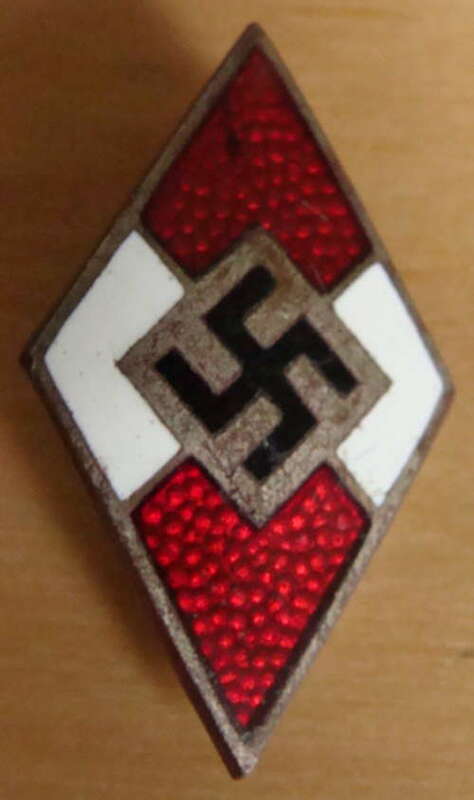 - material: plated bronze with pebbled translucent red enamel. 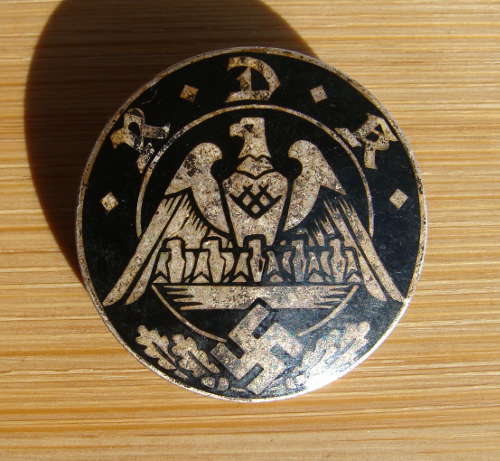 NSDAP Party Member's Badge - maker marked "RZM 1/127" for Alfred Stubbe, Inh. 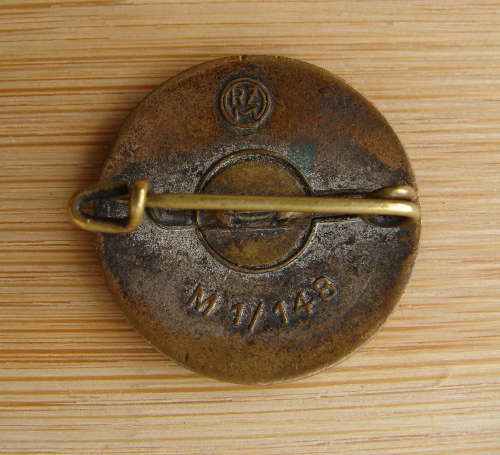 Herbert Tegge of Berlin-Waidmannslust - 23mm dia. 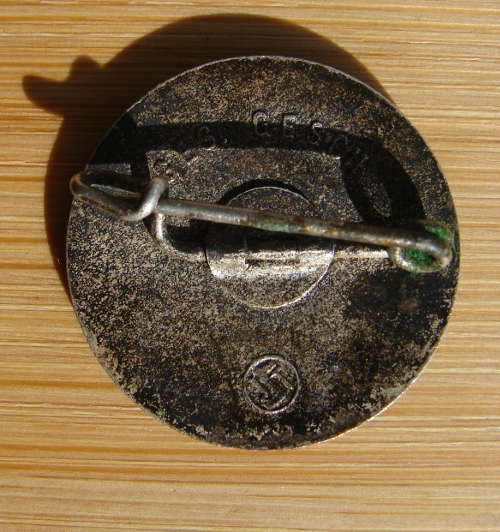 - material: plated bronze with pebbled translucent red enamel. 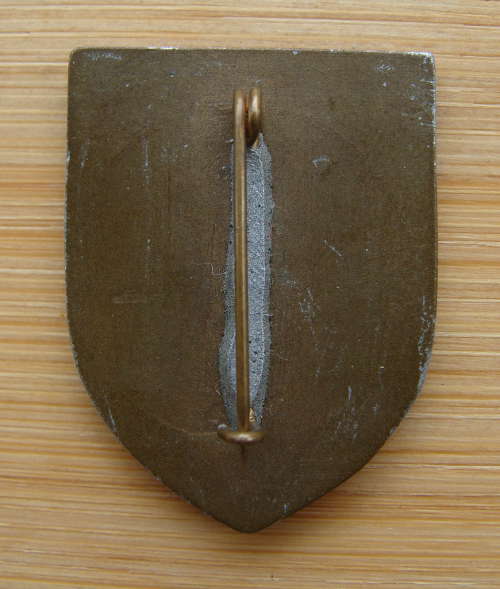 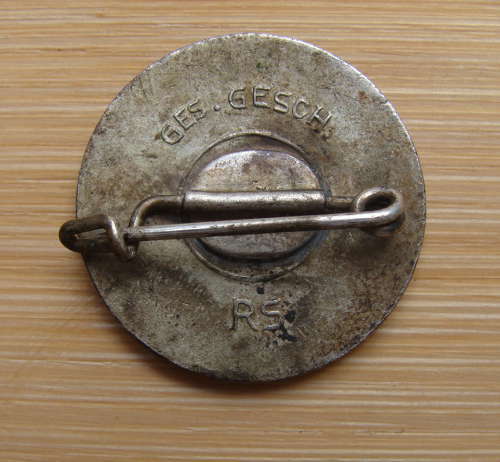 NSDAP Party Member's Badge - maker marked "RZM M1/105" for "Heinrich Vogt" of Pforzheim - 23mm dia. 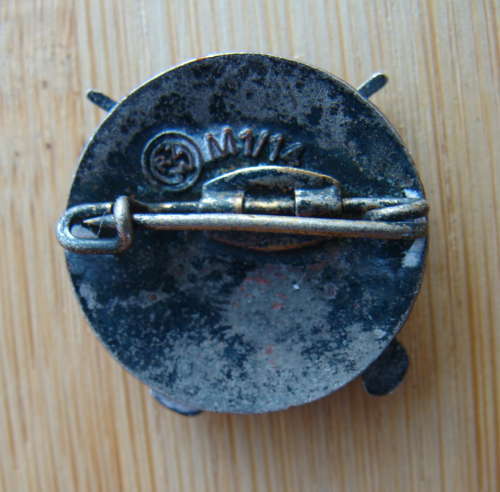 material: plated bronze with pebbled translucent red enamel. 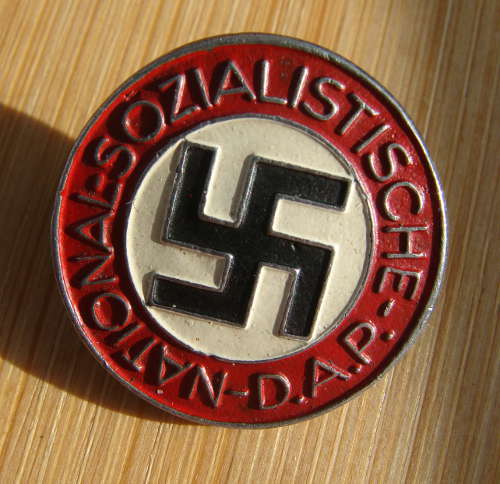 An original badge in outstanding undamaged condition. 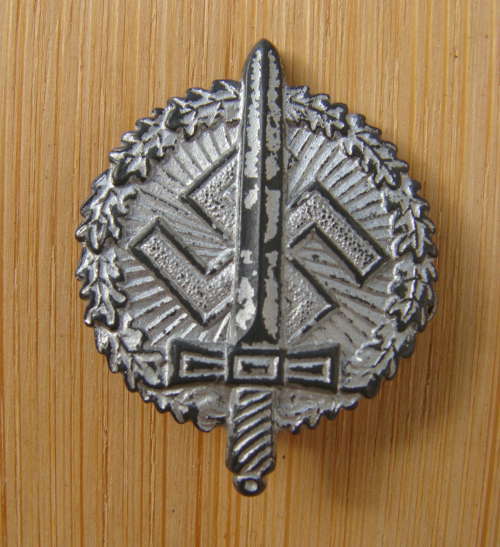 NSDAP Party Member's Badge - maker marked "RZM 130" for "Wilhelm Schroder & Co" of Ludenscheid - 23mm dia. 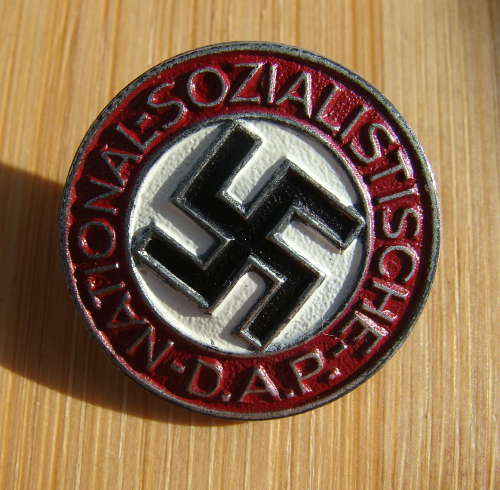 NSDAP Opaque Party Member's Badge - maker marked "RZM M1/13" for Christian Laur of Nurnberg - the more unusual opaque red enamel - Pin fastening - material: enamelled white metal alloy - 23mm dia. 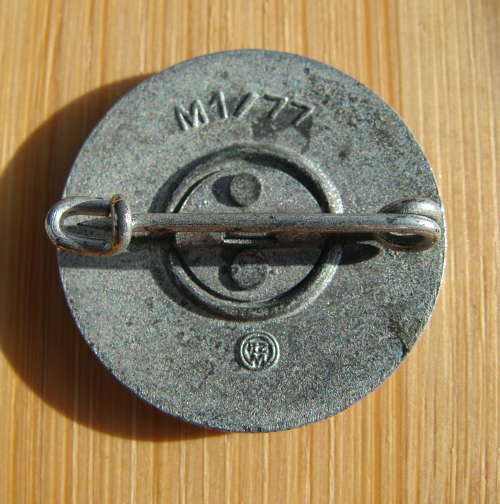 Material: plated and painted zinc alloy - 23mm dia. 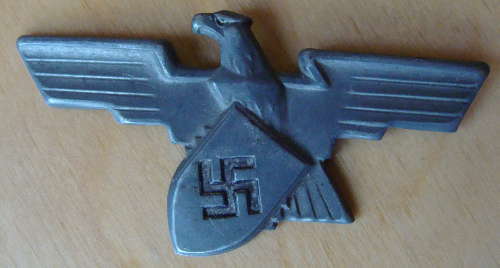 An original badge in used condition. 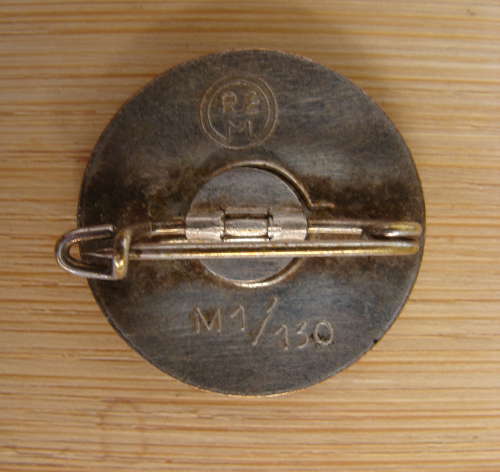 NSDAP Party Member's Badge - maker marked "RZM M1/14" for Matthew Oeschsler & Sohn of Ansbach - 23mm dia. 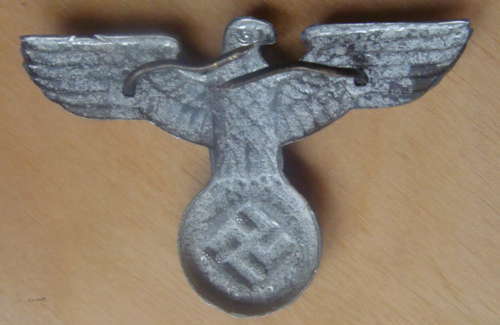 material: white metal with painted finish. 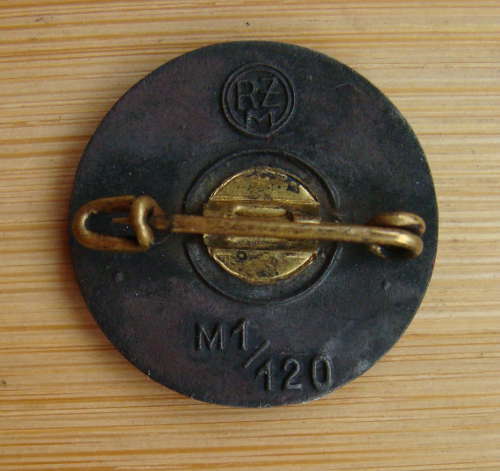 NSDAP Party Member's Badge - maker marked "RZM M1/77" for Foerster & Barth of Pforzheim - 23mm dia. 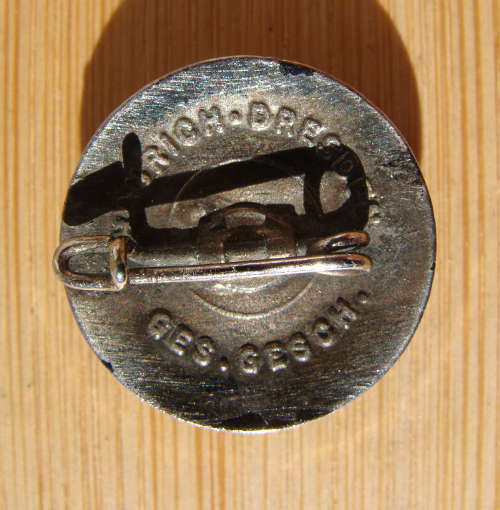 NSDAP Party Member's Badge - maker marked "RZM M1/120" for Wilhelm Deumer of Ludenscheid - 23mm dia. 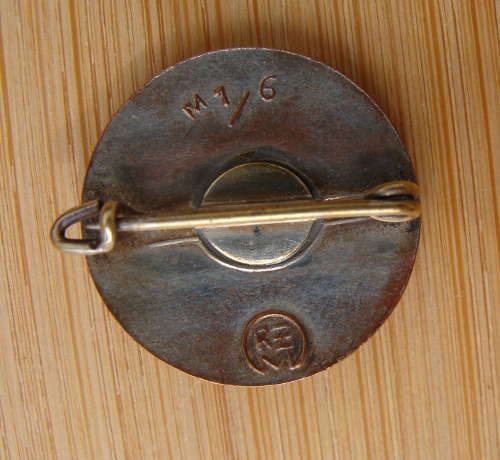 - material: white metal with painted finish, brass pin. 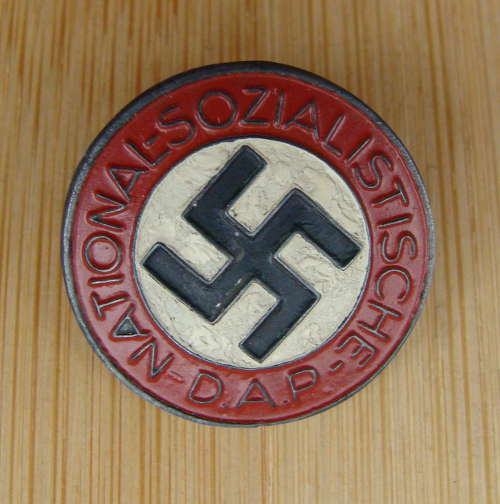 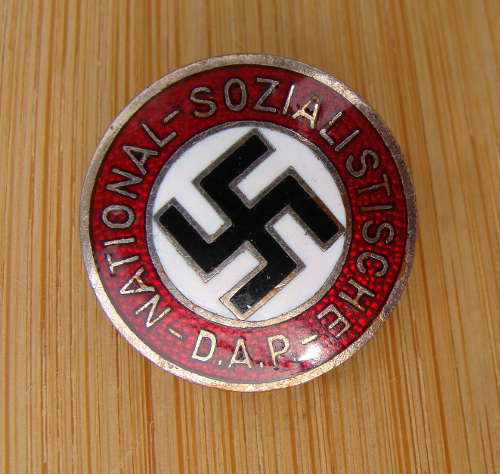 NSDAP Female Party Member's Badge (N.S. 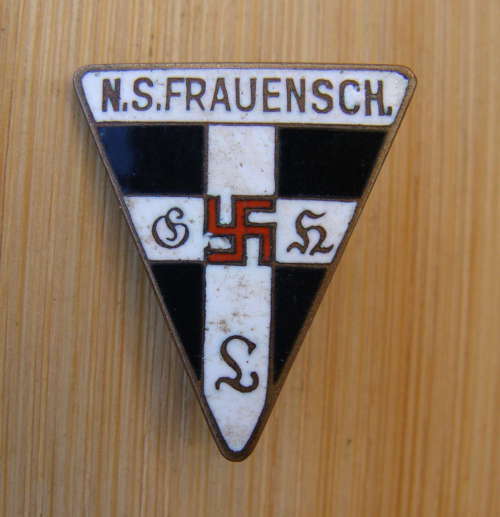 Frauenschaft - National Socialist Women's League) - maker marked "RZM 72" for Fritz Zimmermann of Stuttgart - material: enamelled bronze alloy. 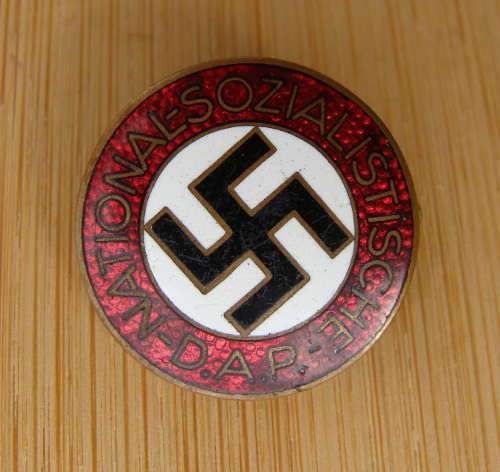 The National Socialist Women's League was the women's wing of the Nazi Party founded in October 1931 and by 1938 membership had reached 2 million 40% of the total party membership. 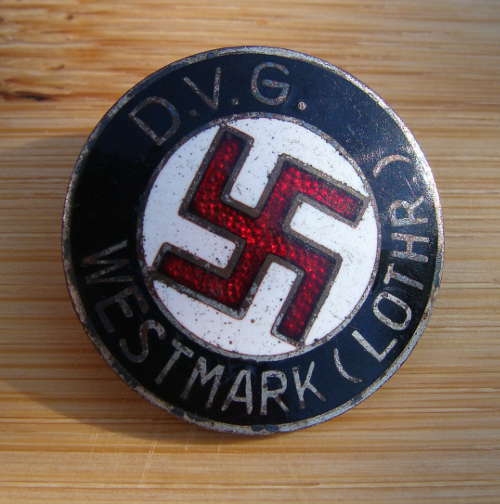 D.V.G. 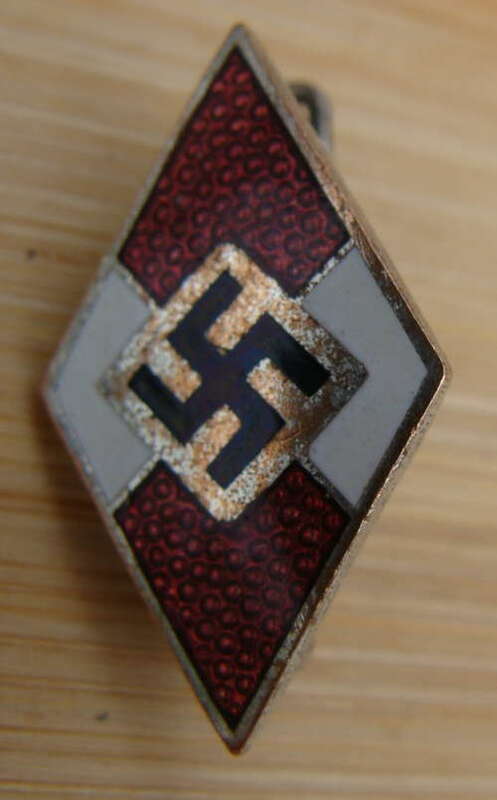 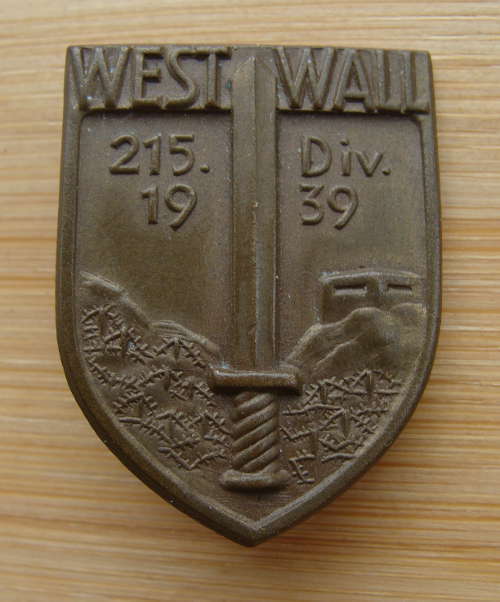 (Lothringen) Membership pin badge - maker marked "W. Redo" of Saarlautern - 23mm dia. 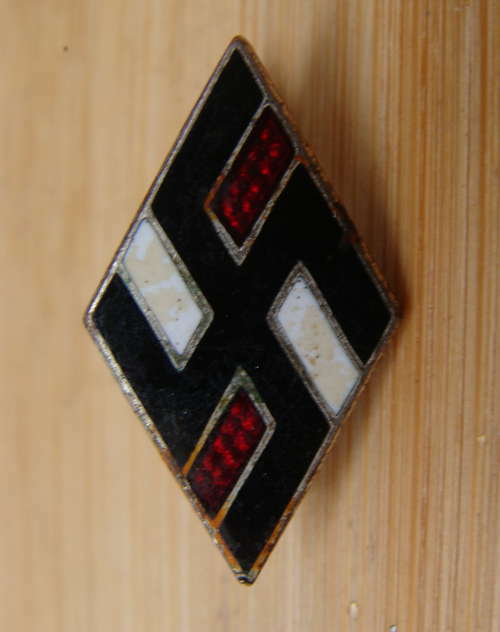 - An original early pre-RZM badge - material: white alloy with black, white and pebbled translucent red enamel. 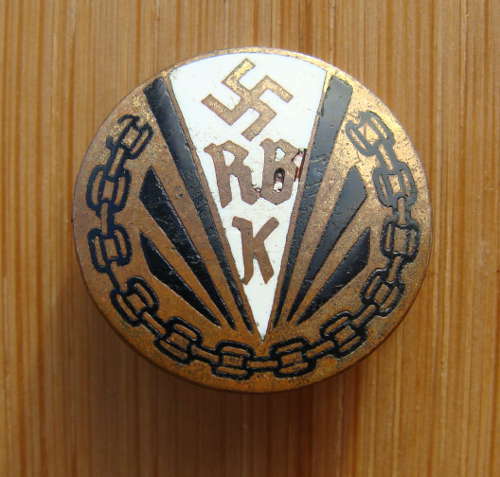 RDK (Reichsbund der Kinderreichen) Badge - maker marked "RS" for Rudolf Souval of Wien - 25mm dia. 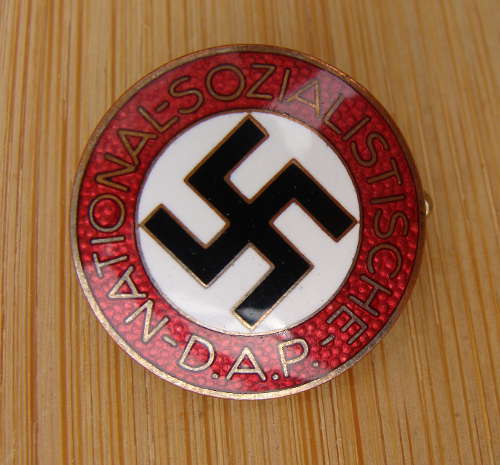 - An original badge - material plated and enamelled white metal - the usual pebbled translucent red enamel and black. 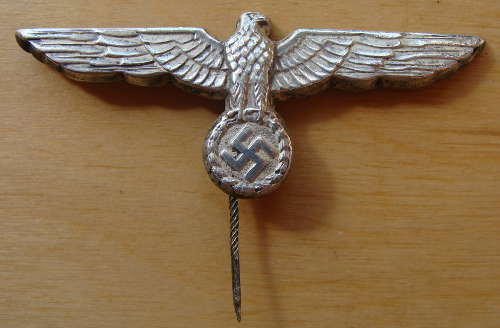 Excellent, original, undamaged condition displaying nice aged patina. 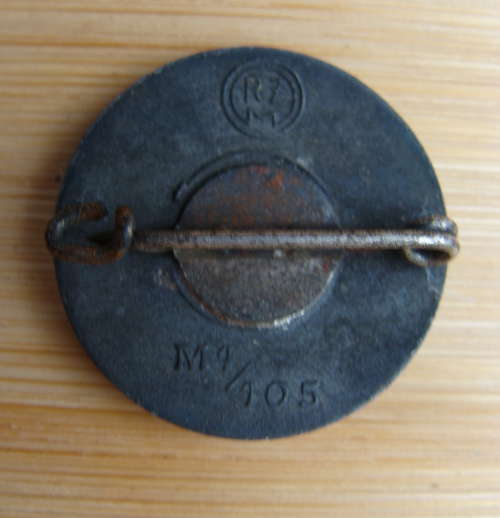 Excellent, original, undamaged condition with aged patina. 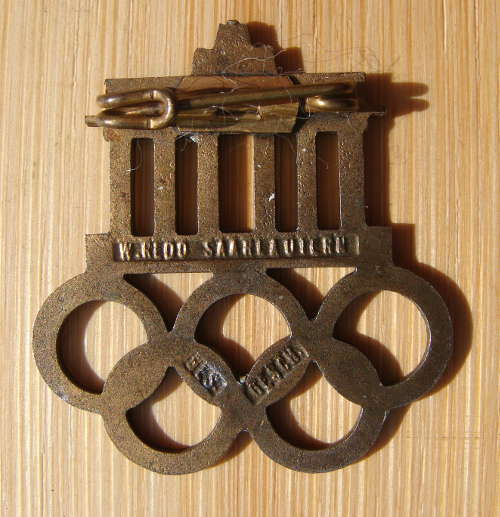 1936 Olympic Badge - maker marked "W. Redo" of Saarlautern - An original badge - material bronze and enamel. 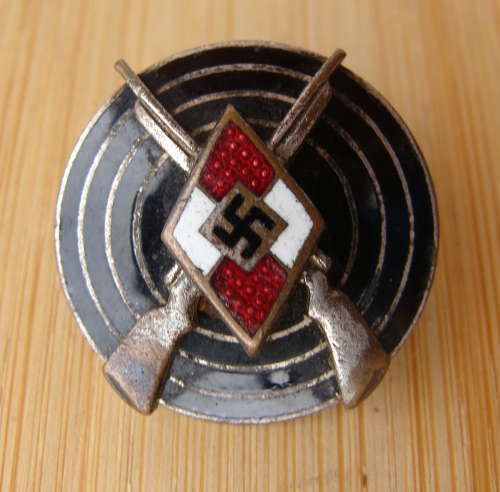 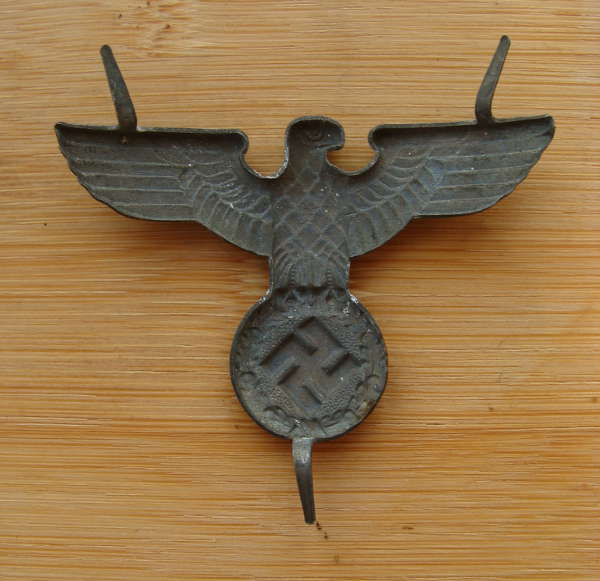 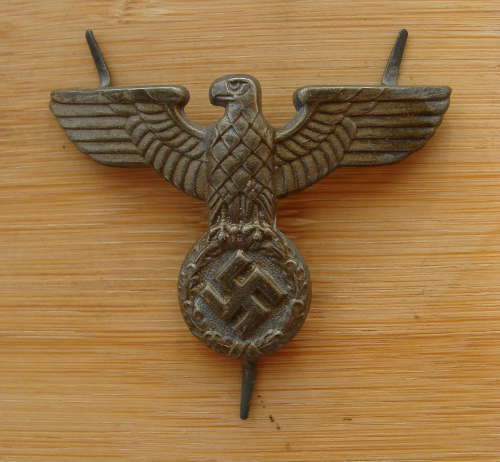 Hitler Youth Shooting Badge - maker marked RZM M1/63 for Steinhauer & Luck of Ludensched - 22mm dia. 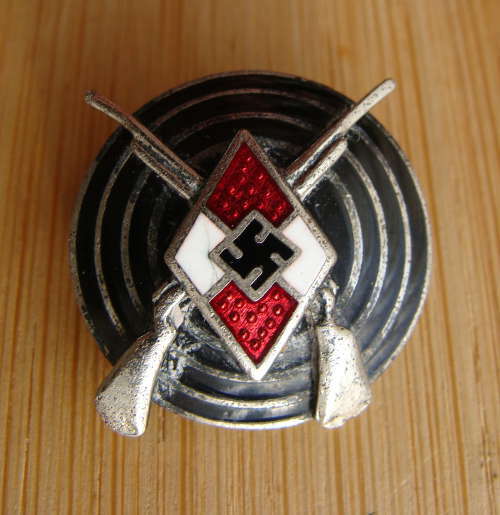 An original badge - material plated and enamelled white metal - with HJ diamond shaped emblem with the usual pebbled translucent red enamel. 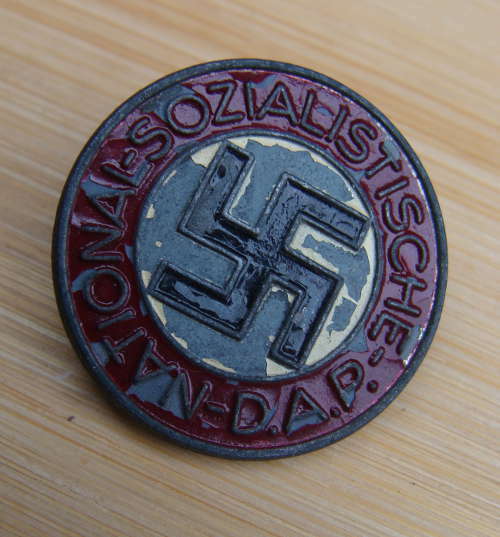 NSDAP Party Member's Badge - maker marked "RZM M1/14" for "Matthew Oschsler & Sohn" of Ansbach - 22mm dia. 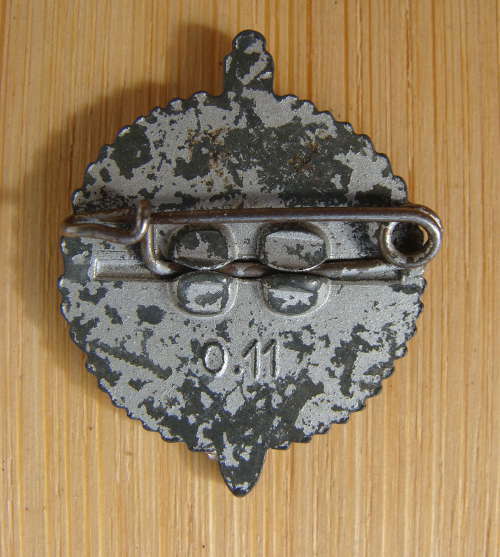 - material: white metal with enamelled finish. 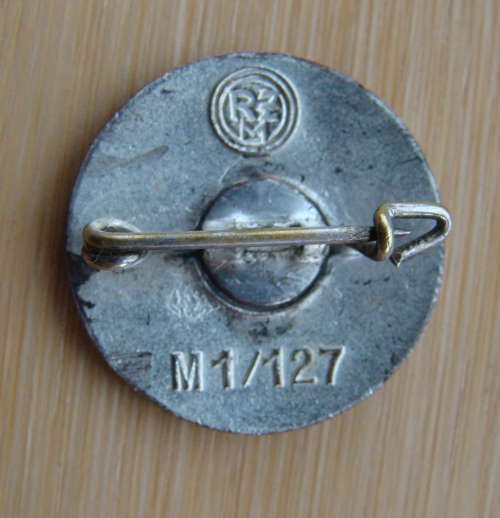 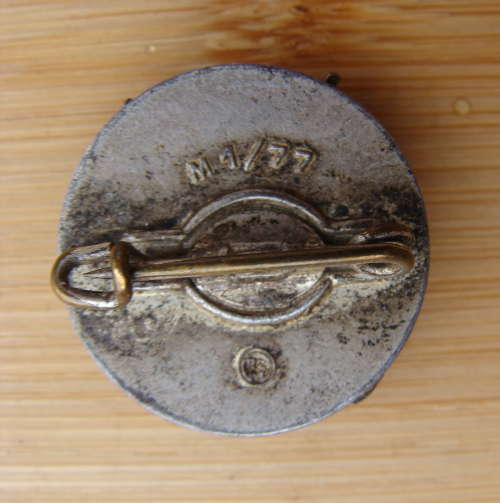 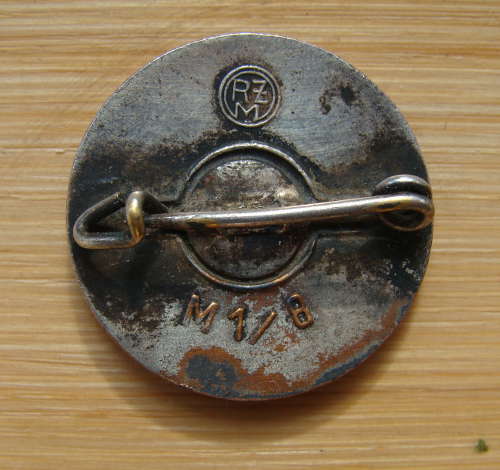 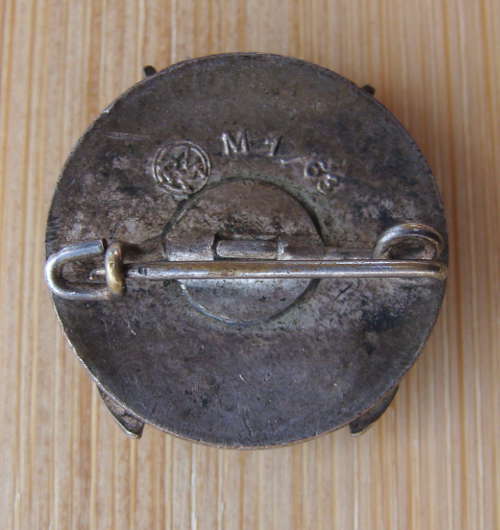 NSDAP Party Member's Badge - maker marked "RZM M1/77" for Foerster & Barth of Pforzheim - 22mm dia. 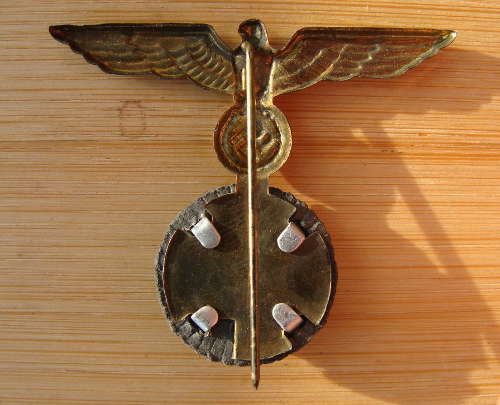 - material: white metal with enamelled finish. 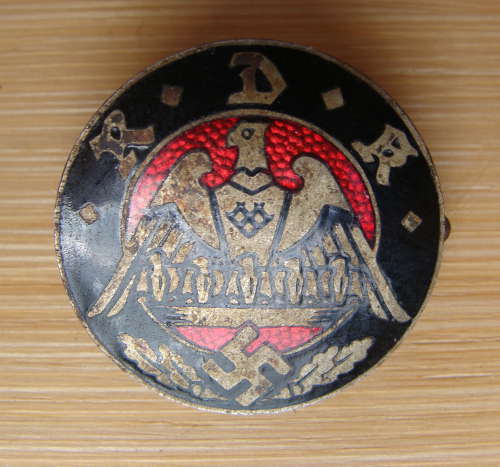 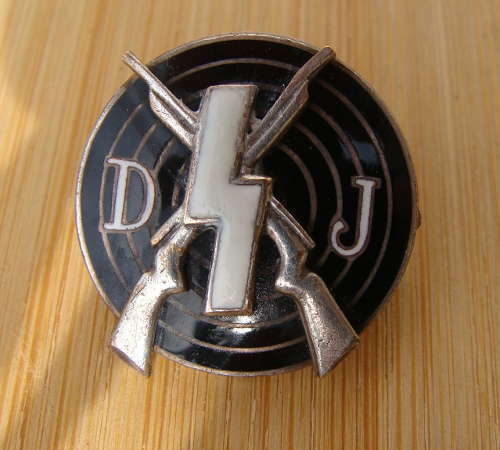 Deutsche Jugend (Greman Youth) Shooting Badge - maker marked "RZM M1/52" for Deschler & Sohn of Munchen - 22mm dia. 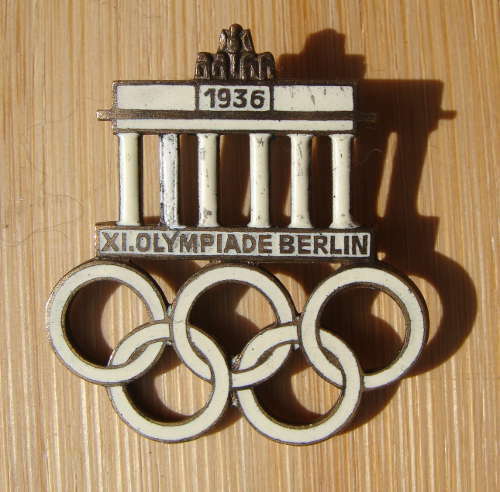 - material: white metal with enamelled finish. 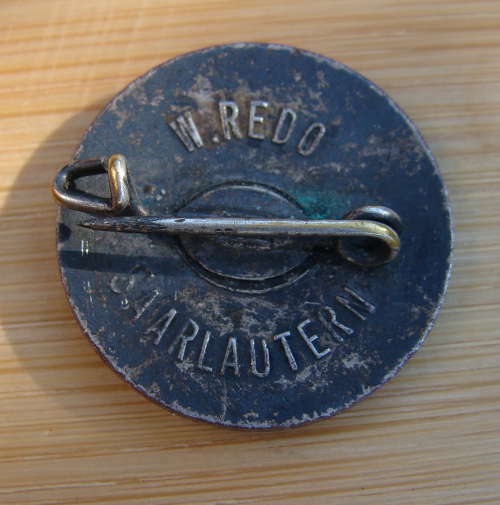 An original badge in outstanding condition. 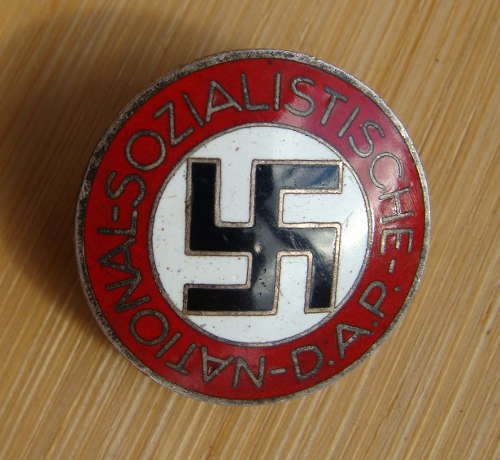 An unusual original badge in undamaged condition. 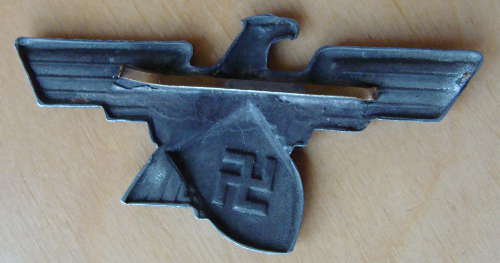 Excellent original example with no damage. 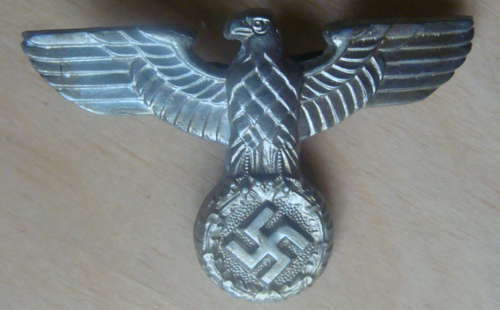 Immaculate original example - no damage. 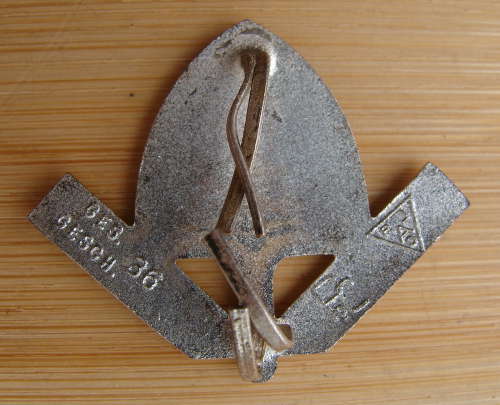 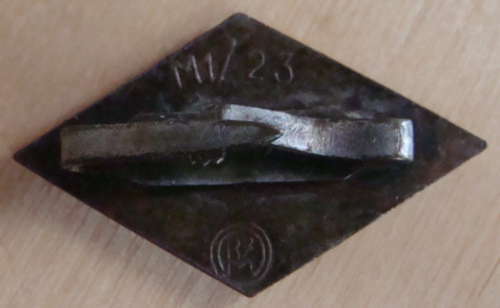 Hitler Youth Knife Lozenge, Prongs remain intact - stamped RZM and maker marked "M1/13" for L. Christian Lauer of Nurnberg. 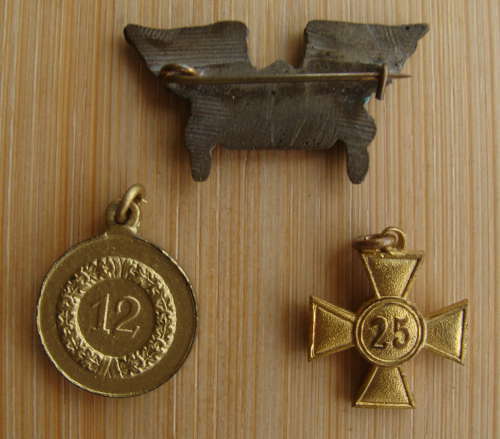 - plated and enamelled bronze - measures 25 x 13mm. 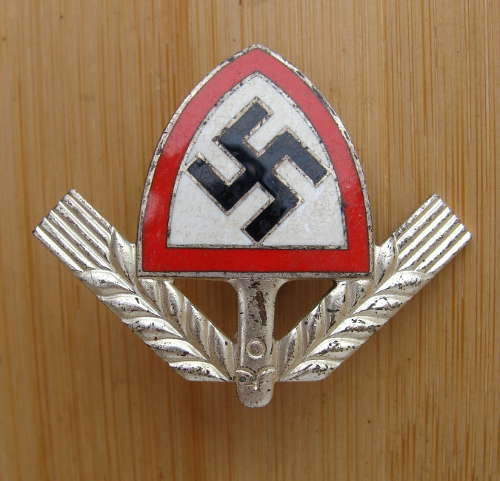 Immaculate original example with no damage. 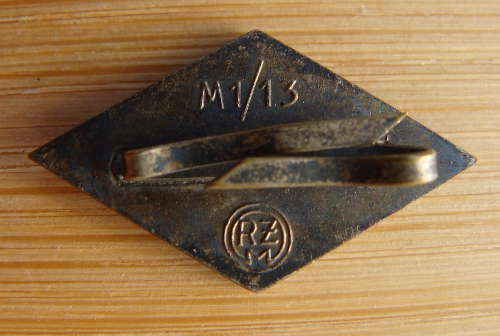 Hitler Youth Knife Lozenge, Prongs remain intact - stamped RZM and maker marked M1/23 for Wilhelm Borgus of Eutingen. 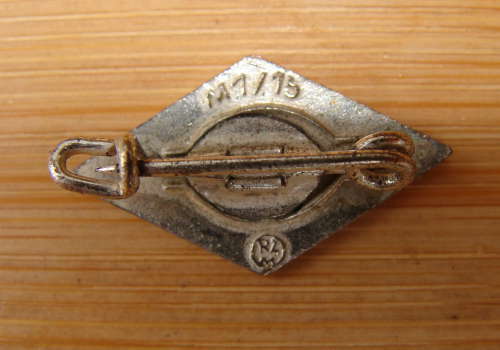 Reinforcing bars have been added to the rear of this original badge to strengthen as they were very delicate, not many survive. 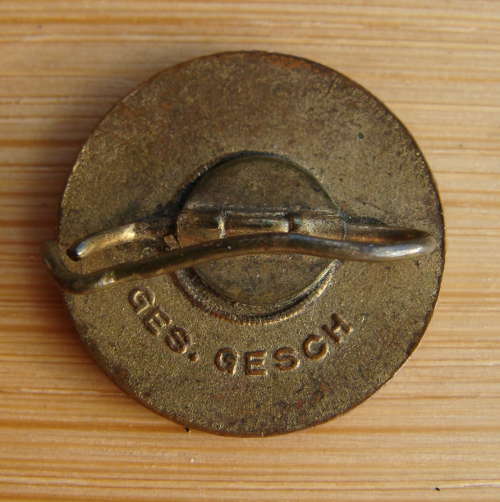 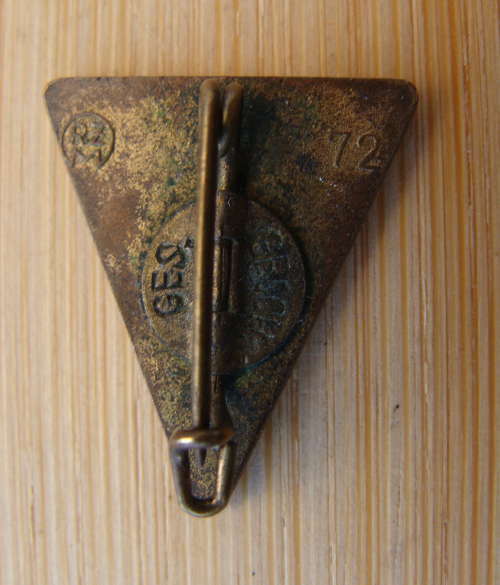 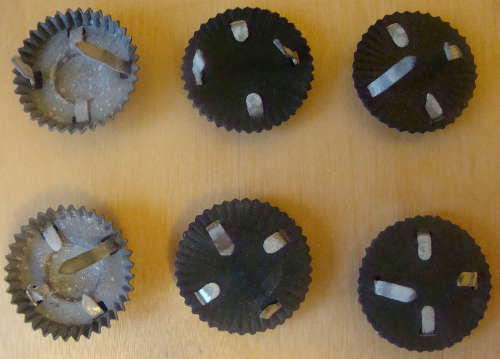 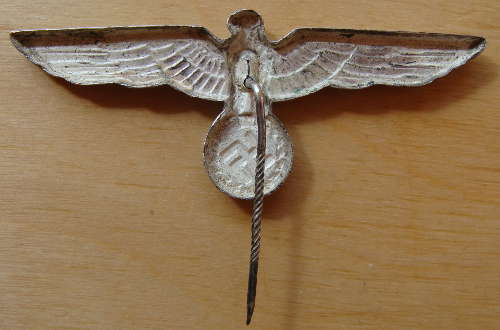 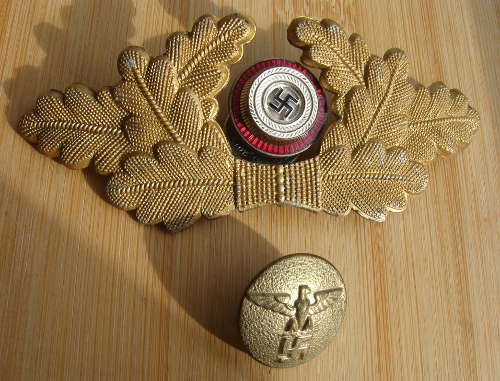 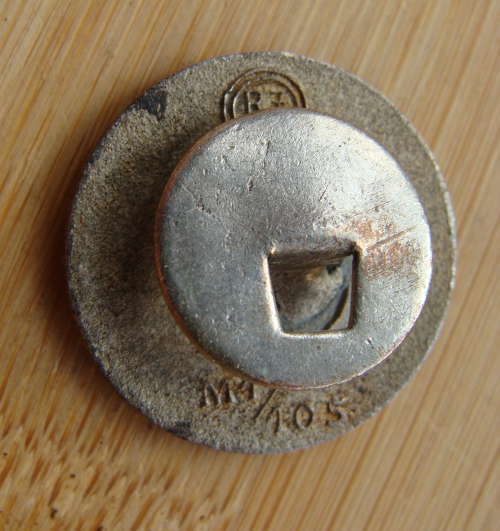 Kriegsmarine (Navy) combined Cap Eagle and cockade - Pin fastening - used on the Kriesmarine ratings cap often refered to as the "Donald Duck Cap"
A rare NSDAP original, period Factory Worker's Eagle Badge - Diestruck alloy. 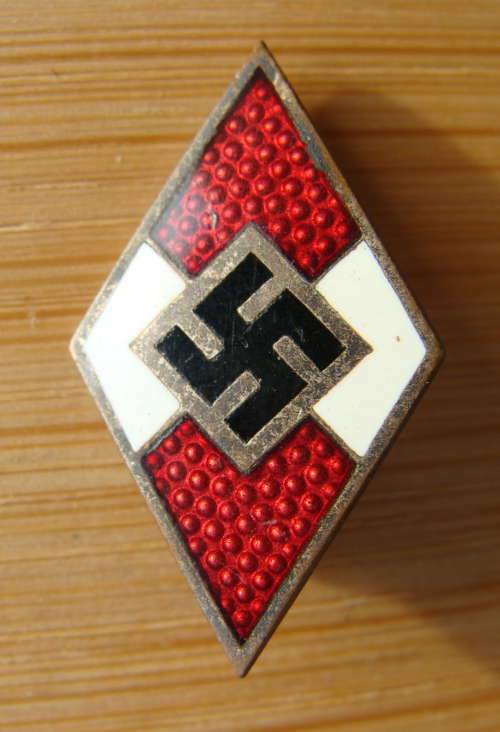 Original period Third Reich, German National Colour, Cockades from a framed period collection - All 6 cockades have all prongs remaining intact. 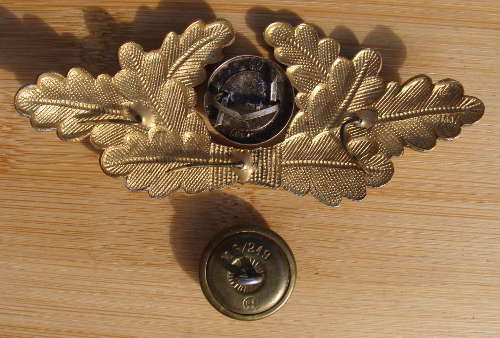 Insignia, cockade and button intact and undamaged with almost all of the plated gold finish intact - All the prongs remain. 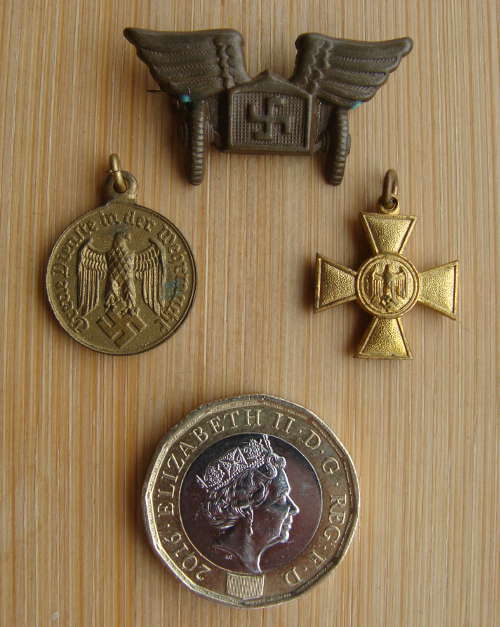 All 3 in excellent undamaged original condition.